Russian painter, born in Moscow, generally considered the pioneer of abstract painting. His 1st work to be so described was a watercolour of 1910; however, all representational elements disappeared from his work only in the 1920s. Wassily Kandinsky was trained as a lawyer and took up painting when he was 30, studying the art 1st in Munich. His early work was related to the Russian Symbolists and the Sezession groups. In 1906 he went to Paris for a year and exhibited at the current Salons. On his return to Munich his work began to reflect the ideas of the French Nabis and Fauves and became related to the Die Brucke group; from the beginning the city of Moscow, Russian icon painting and folk-art strongly influenced him, providing a link with the Moscow avant-garde. 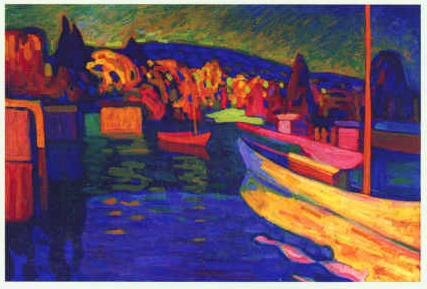 By 1909 Wassily Kandinsky was painting landscapes called Improvisations which reflect a growing detachment from nature. In 1910 Wassily Kandinsky painted his 1st abstract works, making contact with the Muscovite avant-garde, who invited him to exhibit at the 1st Knave of Diamonds Exhibition. His On the Spiritual in Art was publ. in 1912. In 1911 he was a co-founder of the Blaue Reiter. In 1912 K. had his 1st one-man show at the Berlin Sturm Gallery and publ. 2 plays Yellow Tone and Violet, which reflect his interest in relations between colour and music; he also became interested in the German Romantic philosophers, Rudolf Steiner and occultism. With the Bolshevik Revolution he was drawn into administrative work in the art field. In 1920 Wassily Kandinsky drew up a programme for a new teaching system in art schools, but its Symbolist philosophy was rejected by the Constructivists and was put into practice only after he had left Russia and joined the Bauhaus school in Weimar (1922). In 1920 K. began to paint again, introducing geometrical forms which became strictly abstract, reminiscent of Suprematist and Constructivist work; such forms remained typical throughout his Bauhaus period up to 1933, when he moved to France and came under the influence of Miró, his forms becoming more fluid and Surrealist. While at the Bauhaus he wrote Point and Line to Surface (1926), which deals with the nature of form.